Skip Arculli won the World Pairs Championship (gold medal) at Aberdeen, Scotland in 1984 (w/George Adrian). He also played on the U.S. World Bowls teams in 1988 (New Zealand) and 1996 (Australia). Skip appeared in nine United States Championships events representing the Eastern Division and holds four titles. He had Singles victories in 1978, 1981 and 1995; and won the U.S. Pairs crown in 1983 (w/J. Candelet). His other appearances in the U.S. Championships were in 1979, 1981 and 1990. A National Open "Triple Crown" champion, Skip won the Open Singles in 1981, the Open Pairs in 1978 and 1983, and the Open Triples in 1983 and 1985. He was named National Open "Bowler of the Tournament" in 1978 (tie), 1981 and 1983. Skip represented the United States in various major international competitions, including the Asia-Pacific Championships in 1993 (Victoria, BC). Born in Hong Kong, becoming a U.S. citizen in 1973, Skip served on the ALBA National Council 1984 to 1988, during which time he also managed the ALBA Memorial Foundation portfolio. Jim Candelet won seven U.S. Championships titles: Singles in 1961, 1966, 1971, 1980; Pairs in 1959 (w/R. Smart), 1968 (w/R. Smart), 1983 (w/Skip Arculli). In all, he qualified for ALBA's premier annual event 14 times. His collection of U.S. Championships gold medals rank third all-time (tie w/Willis Tewksbury) Jim also registered six National Open victories: Pairs in 1970; Triples in 1964, 1971, 1975, 1976 and 1982. He skipped every event. He was a member of the USA's first World Bowls team in 1966 (in Sydney), as well as the 1972 (Worthing, England), 1976 (Johannesburg), 1984 (Aberdeen, Scot) World Bowls teams, and managed the U.S. contingent in 1980 (Frankston, Australia). At the 1972 event, Jim and partner, Willis Tewksbury, won the silver medal in Pairs. Four years later, he teamed with Frank Souza and Harold Esch to finish fourth in Triples; and, in 1984, he took ill after two matches, and partner Skip Arculli continued on with a replacement player to capture a gold medal. 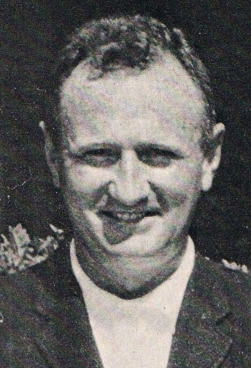 Jim was president of ALBA from 1970 to 1972, and an Eastern Division national Councilor for twenty years, 1964-1984. He was ED president in 1959. He took up bowls at the age of 12 years in St. Petersburg, Florida, and later in Pawtucket and Providence, Rhode Island. Isabella Forbes, joined the Essex County Lawn Bowling Club in 1957 as the youngest member ever of that club. She attended her first National Open Tournament in Chicago, IL in 1974, winning the National Open Triples with Jo Gilbert and Marie Clausen (a new bowler at that time). She has only missed 2 National Opens since then. Izzie, as she is affectionately known, served as a Board member for the Eastern Division for more than 15 years and held the offices and duties of Club representative, Treasurer, Councilor to the AWLBA and President of the Division. Also, served as the division Games Chairperson for over 10 years. She served on the Board of Directors for the Essex County Club for approximately 10 years and became its first woman President in 1979. Izzie represented the Eastern Division in the United States Championships 12 times between 1982 and 1999 before relocating to Long Beach, CA. She was part of the organizing committee for the First U. S. Championships held in Buck Hill Falls, PA and served as Games Chairperson on the committee for the first Atlantic Rim Games held in Sun City, Florida. This was the first and only large International Tournament held in the United States. She won the US Pairs Championships in 1982 with lead Ceil Brown from the Bridgeport LBC. Izzie played for the USA at World Bowls in Melbourne, Australia 1985 and Ayr, Scotland 1992. Played in the Pacific Rim Games in Fiji in 1989. Managed the US teams for World Bowls in Leamington Spa, England and most recently the Pacific Rim Games in Moama, Australia in 2001. Izzie moved to Southern California in 1999 due to work commitment and the yearn to bowl all year round and has served the Women’s Southwest Division as Games Chairperson since 2000 and National Tournament Chair for the last 4 years. Presently she bowls out of the Long Beach Lawn Bowling Club where she became a member in 1999. Harry Furze President of ALBA 1928-1929, Harry Furze undertook the task of obtaining International Bowling Board (IBB) affiliation for the American Lawn Bowls Association. His efforts were realized on July 12, 1938. Furze was appointed cochairman of the World Bowling Tournament in 1932, held concurrent and staged next door to the Olympic Games held in Los Angeles. The event was held July 18 through August 8 on the three-green complex of the Los Angeles Lawn Bowling Club, directly adjacent to the LA Coliseum, site of the Olympics. An extraordinary bowls enthusiast in an era when means of travel were few, lengthy and expensive, Furze organized a successful U.S. bowling tour to Great Britain in 1929. A year earlier, he accompanied a group of New Zealand bowlers, en route home from a trip to England, on a 14 match cross-country tour of the U.S., with stops reaching from Buffalo to Chicago to California. His home club was in Montclair, New Jersey, which lists Furze in its historical file as an outstanding bowler and a traveling ambassador of the sport. Jo Gilbert began her bowling career in the then Eastern Division in 1971 at the Essex County LBC.. Her first appearance at a National Open was in Chicago in 1974, at which time she won the triples event with Izzie Forbes and Marie Clausen. She went on to win numerous local, divisional, and national events. She and Jack moved to Florida in 1979, bowling at the Daytona Beach, LBC. She participated in 12 US Championships, winning the Pairs competition with Nora Miller Dorman in 1987 and 1988; and in 1996 with Patti Grabowski. Jo was on the US Women's teams 5 times: at World Bowls in Australia in 1985 and in New Zealand in 1988; at the Pacific Rim games in Papua New Guinea in 1987 and Fiji in 1989; and the inaugural Atlantic Rim games in Florida in 1993. Jo served as an AWLBA councilor for 9 years. She served as Treasurer of the National Organization in 1978 and again in 1982. Under the AWLBA presidency of Ruth Gillard in 1987, she was appointed the Women's National umpire chairman. During this time, she established the Policy and Procedure Manual for women umpires. Jo was an official at the Paralympic lawn bowling games held in Atlanta, GA in 1996. During 2001-2002, she was a member of the National Committee to establish criteria for the selection of National Team members. Clifford Gillam The President and Chairman of the Board of the Buck Hill Falls Corporation, Buck Hills Falls, PA, Clifford Gillam was an activist and supporter of top level competitive bowling in the United States. In 1958, Gillam's Buck Hill Falls bowling greens hosted the inaugural Men's U.S. Pairs Championship, and the Pairs event was staged on the Buck Hill greens for its initial twelve years. The perpetual U.S. Pairs Championship Trophy is an elegant sterling silver bowl provided by Gillam and the Buck Hill Falls Corp. From 1960-1969, Buck Hill Falls was also site of the annual U.S. Singles Championships. Gillam introduced a pair of popular open tournaments in the 1960s designed to encourage participation and competition between American and Canadian bowlers. His untimely death cancelled plans to establish a Lawn Bowls Hall of Fame at Buck Hill Falls, and marked the beginning of the movement of ALBA's showcase national tournaments to other locales from year to year. Upon his passing, Gillam was elected Honorary Life Member of ALBA. 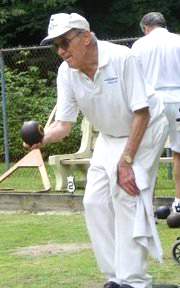 Jim Graham began lawn bowling when he joined the Thistle LBC in Hartford, Connecticut in 1952. Since then, he has held many administrative positions and has participated in tournaments both domestic and international. He lived and worked in the Hartford area for forty years before retiring to California in 1992. He was a senior vice-president of the Connecticut Bank and Trust Company.Administrativly, Jim served extensively at all levels. On the national level he was a councilor representing both Eastern and the Southwest Divisions of the United States Lawn Bowls Association for a total of eight years. In addition, he served as Treasurer of the USLBA Memorial Foundation (five years) and as Chairman of the National Team Selectors (five years).At the Division level, Jim held the position of President of the Eastern Division, Secretary/Treasurer of the Eastern Division, and Secretary/Treasurer of the Southwest Division for eight years. While at the club level he held the presidency and other offices of every club to which he has belonged.In competition, Jim Graham took first place in the Eastern Division numerous times and qualified for the United States Championships on three occasions, winning the Championship Singles in 1984. He played as a member of Team USA in Papua New Guinea at the Asia-Pacific Championships in 1987. Dorothy Henry A championship bowler with a great singing voice, Dorothy Henry was president of the American Women's Lawn Bowls Association in 1978, and before that was president of the Eastern Division (now Northeast Division), while bowling out of the New York Club in Central Park. She was a leader in getting the women's United States Championships started in 1977 at Buck Hill Falls, PA. Dorothy was the United States Champion in Singles in 1980 and in 1988 and in Pairs in 1989. In the National Open Tournament, she won the Pairs in 1989 and the Fours in 1990. While best known for her smooth delivery, many recall that Dorothy would often break into song during her matches. She had a lovely voice.Dorothy spent the latter part of her bowling career in Southern California where the faster greens were easier on her failing knees. She retired to Colorado. Marie Manners began her lawn bowling career at the Essex County Club in 1968. She served various terms, with distinction, as President and Secretary of the Essex Club. She also served as President and Secretary of the Ladies Eastern Division. In addition to her administrative leadership, she was an active player on both the local and divisional levels of our game. She won several titles such as Women's Singles and Pairs Champion and placed highly in each of the Ladies' Eastern division Open events. She was the driving force behind the merger of the Men's and Women's clubs at Essex and was elected the first female President in the history of the Essex Club. She and her husband Bill bowled as guest members of the Buck Hill Falls and Skytop Clubs located in Pennsylvania throughout their careers. Hersister, Jo Gilbert, is also a member of the USLBA Hall of Fame. Dr. Frank McGuire was the first President of the American Lawn Bowls Association. Chairing an organizational meeting of lawn bowling enthusiasts on July 27, 1915, in Buffalo, New York, Dr. McGuire was elected President of the new ALBA. He headed the novel group through 1919. Dr. McGuire was the first president of the Meadow Lawn Bowling Club in upstate New York, the forerunner of the Buffalo LBC. In 1916, Dr. McGuire organized the first recorded international event ever held in the United States, attracting 92 U.S. and Canadian rinks teams. In 1921, fourth year of the National Open Tournament, Dr. McGuire skipped his Rinks team to the championship. Frida Mixson was president of two divisions: the Southeast in the 90s and the East (now called the Northeast) in the 80s. She moved to Sun City Center, FL in 1993, after bowling in the inaugural United States Championships for women in 1977 and after winning the U.S. Pairs championship with Edith Miller in 1985. Frida also represented the Southeast Division in the United States Championships in 1997. In the old American Women's Lawn Bowls Association, She was national secretary from 1982 until 1986. Frida died on January 27, 2001. Charles Rettie U.S. lawn bowling pioneer Charles Rettie was Secretary-treasurer of the American Lawn Bowls Association 1937 through 1945. A charter member of the Thistle Club in Hartford, Connecticut (organized June 26, 1913), he was also one of the original members of the New England Association, forerunner of ALBA's Eastern Division and the USLBA's Northeastern Division. Rettie served as Secretary of the Eastern Division. On the green, he was one of the country's top players, skipping the winning Rinks (fours) team at the 1928 National Open. Among the other recorded major tournament victories that Rettie skipped: the 1918, 1924 and 1925 Walter Scott Rinks Trophy; the 1928 M.F. Robertson Rinks Trophy; and the 1935 McGuire-Lockie Rinks Trophy. Randall Spalding The owner and manager of the Spalding Inn Resort and Spalding Inn Lawn Bowling Club, in Whitefield, New Hampshire, Randall Spalding inaugurated the United States Championship Singles in 1957 and donated the event's perpetual sterling silver championship cup. The U.S. Singles Championship was hosted again on the Spalding greens in 1958 and 1959, and at additional times since. Some years both the Singles and Pairs Championships were played on the Spalding greens. For many years, the Spalding Inn hosted a popular annual USA vs. Canada competition, as well as a yearly media-attracting visitation by Williamsburg, VA lawn bowlers playing in colonial dress. Spalding's passion for the game of bowls provided impetus for Clifford Gillam's and Buck Hill Falls' elevated involvement in competitive bowling, as well as an overall increase in respect for the game of bowls. For many years, both the Spalding Inn and Buck Hill Falls bowling locations were America's lawn bowling showplaces. Ann Wood was president of the now merged American Women's Lawn Bowls Association in 1984. Coming from Sun City Center, Florida, she served that organization in many ways. She was national secretary twice; second vide president and the first VP; chairwoman of the National Open of national Singles and Pairs of the Eastern Games and of the inaugural Atlantic Rim games; member for five years of the National Team Selection Committee; and U.S. delegate to Women's International Bowls for 10 years. Ann was president of the old Eastern Division and secretary of SE-AWLBA. She edited AWLBA's 25th anniversary booklet in 1955 as well as the Handbook of Lawn Bowling published in 1998 by the AWLBA Memorial Foundation. Ann got into lawn bowling in 1978, and won many local tournaments in the East and Southwest.